The Port Times Record, Times of Middle Country and Village Beacon Record published this piece in print on Sept. 08, 2016. When Daniel Scofield died in 2011 from a heroin overdose, his mother Dori decided to do something. In April 2014, the founder of Save-A-Pet Animal Rescue and Adoption Center started Dan’s Foundation for Recovery, a not-for-profit organization that provides assistance to those suffering from alcohol or substance abuse. The group uses its donations to help an addict get help — it assists addicts in covering insurance copayments, treatment and travel costs to recovery centers in other states. 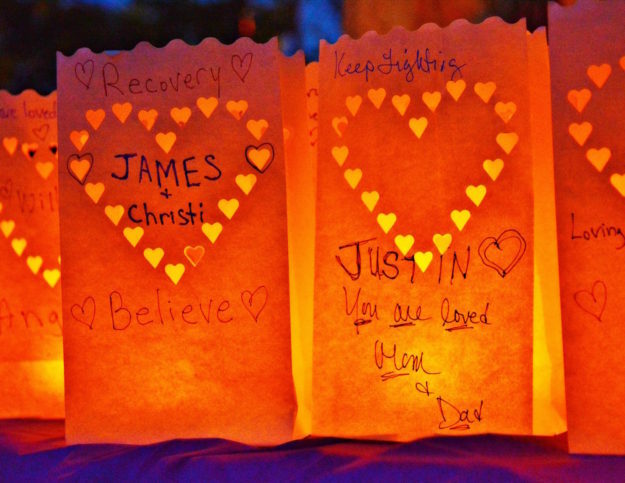 Scofield co-hosted Lights of Hope on Aug. 31 at Memorial Park in Port Jefferson. 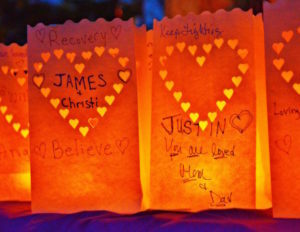 The event, which is in its third year, brought together families and friends to remember those who died from a drug overdose and to support those who are recovering from drug addiction. The event’s other co-host was Public Relations Director Debbie Gross Longo of the New York Chapter of Magnolia New Beginnings, an advocacy, education, support and addiction resource group. Longo’s son was a soccer player at Ward Melville High School. He was so talented, she said, he was being scouted by colleges. That was before he tore his quadricep. The doctors at John T. Mather Memorial Hospital in Port Jefferson prescribed him oxycodone, and he became addicted. The price per pill of oxycodone is expensive — about $45 each, Longo said. So he switched to heroin, a much less expensive but more potent drug. Before long, his personality began to change. Longo said her son is now living in a sober community in Florida helping other addicts get into recovery. 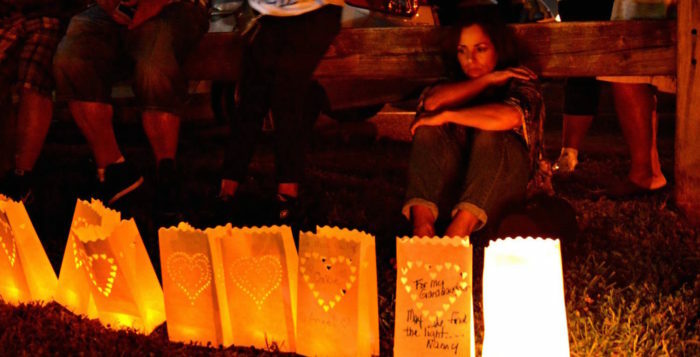 According to a 2015 New York State Opioid Poisoning, Overdose and Prevention report, there were 337 heroin-related deaths in Suffolk County between 2009 and 2013 — more than any other county in the state during that period. In a brief speech at the Lights for Hope event, Scofield stressed the importance of helping those addicted to the drug get into recovery. 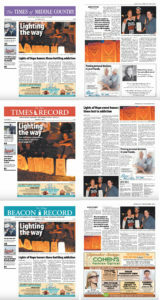 Earlier that day, she said, she helped a young girl who lost her mother get into the Long Island Center for Recovery in Hampton Bays as well as three other young people get into a rehabilitation facility in Arizona. Scofield’s son David, 28, went through heroin recovery. His mom said her sons were best friends and they did everything together, including using heroin. 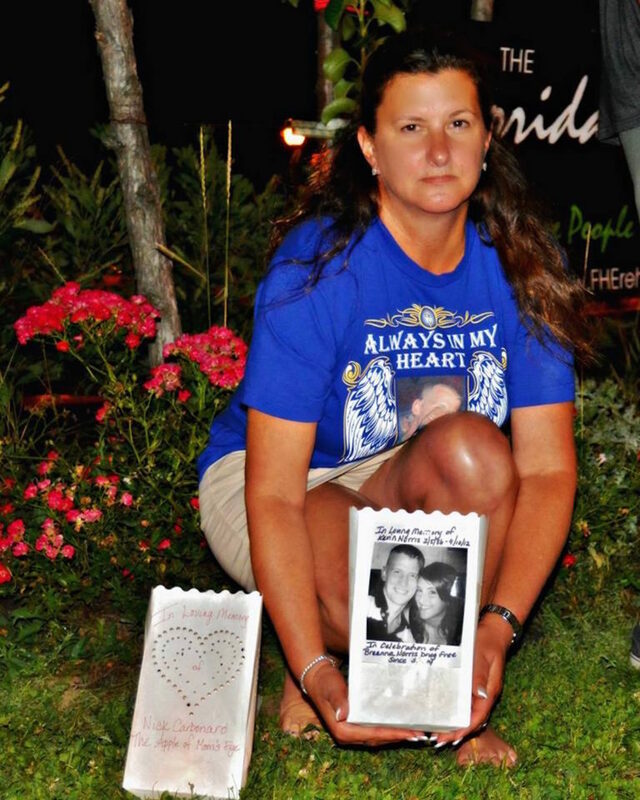 Tracey Budd, a Rocky Point resident and founder of North Shore Drug Awareness Advocates, displays her luminaire in memory of her son Kevin during the third annual Lights of Hope event in Port Jefferson on Aug. 31. Photo by Nora Milligan. Event attendees decorated white paper bags with the name of a loved one who died from heroin or who recovered from it, and a message. Toward the end of the evening, a candle was placed inside each bag, and they were arranged in a large circle around the cannon in the park. Budd’s son Kevin died in September 2012 from a heroin overdose. Her daughter Breanna has been drug-free since May 2014. She said the stigma of addiction has changed dramatically since 2008 at the height of her son’s struggle with heroin. There is now a community of families that support each other through a child’s struggle with addiction or an addict’s death. Middle Island resident Hugh Rhodus said the worst part of the heroin problem on Long Island is going to a funeral for a young person. He recently attended the funeral of a friend’s 24-year-old nephew. Rhodus and his wife helped their daughter Amanda through her 13-year struggle with heroin. He said when they first tried to get her help, they took her to Mather Hospital, where they waited for a couple of hours after speaking with a nurse in a “room in the back.” Eventually, they were told to go to a hospital in Nassau County because Mather Hospital was unable to help Amanda. Legislator Sarah Anker (D-Mount Sinai) praised families and recovering addicts for not giving up. 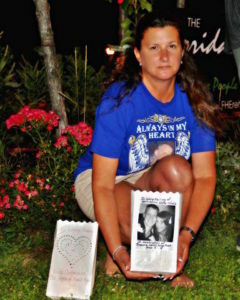 A woman Nicole sits on the grass in Port Jefferson remembering those who were lost to and those who survived heroin addiction during the third annual Lights of Hope event on Aug. 31. Photo by Nora Milligan. 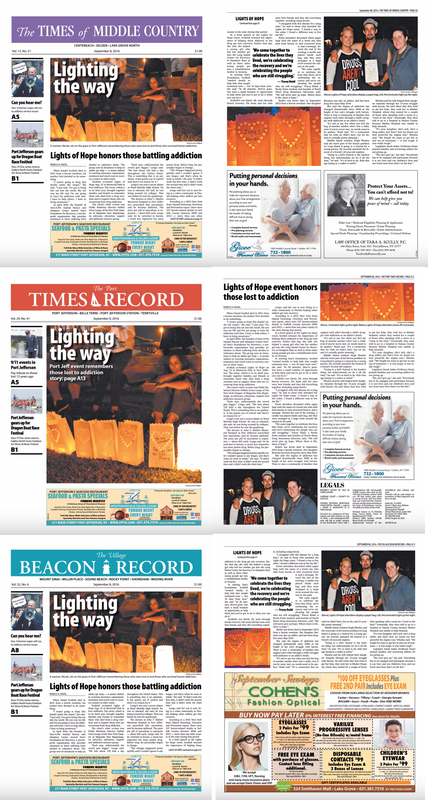 Lit luminaires light up the night during the third annual Lights of Hope event in Port Jefferson on Aug. 31. Photo by Nora Milligan.